© Karen Schulman. All rights reserved. A crowd had begun to gather. I thought my Spanish was passable but I was only able to understand a few words of the lively conversation taking place before me. My Ecuadorian friend, Jose’ appeared to be negotiating with the Andean man who had approached us. 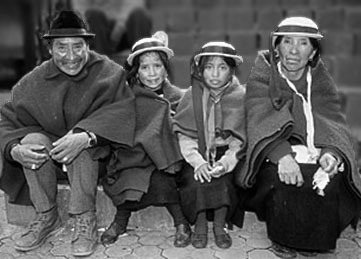 I had made a few photographs of he and his family during the festivities in the plaza the day before. I had asked his permission to do so and gave one of his daughters a few sucres (local money) and some candy. The family had seemed pleased to smile for the camera. Now, as I listened, the man continued to speak in his native dialect, gesturing toward me. The onlookers seemed amused. I tugged at Jose’s sleeve to get his attention; he turned and motioned for me to be patient and quiet. The conversation’s pace was far too fast for me to catch what was going on. Finally, the man turned to me, nodded and smiled, said something to his wife and daughters, turned and walked off. The curious crowd of onlookers that had grown in size, was now dispersing. I felt uncomfortable being the center of attention and was anxious to move on. “Buy them a tractor!” I exclaimed. A tractor? This was certainly a first for me! Though I was relieved that the scene was over, I was (and continue to be) concerned about how travelers are perceived when we photograph people during our travels. The “tractor incident” illustrates just how these perceptions can be misleading. This does not apply only in foreign countries, but closer to home as well. It would be quite easy to have a similar problem on a Native American Reservation or with a culture like the Amish or others whose beliefs may differ from our own. Being sensitive to the different habits of people from other cultures/countries is important. Though patience and a smile will go a long way, just what are the ethics of making people pictures while traveling? Should we pay for the privilege of doing so or are we, in essence, creating beggars out of those who would otherwise be happy to pose? Is it O.K. to offer candy or pens to the children? Or is it enough to be friendly? And what about the professional aspect… stock photo agencies now require a written model and/or property release for images which have the possibility of being used for many commercial purposes. I don’t believe that there is one right answer. It’s important to evaluate each situation on its own terms. Adhering to the Golden Rule generally helps. Usually, when I first arrive at my destination, I take some time to wander around and “visit” without my camera. If I’m planning on staying for a while, I may not carry a camera for a few days or until I get to know a little about the people and their lifestyle. This may be as short as a few hours if I am just passing through. When I am the guest of a local family, personal introductions can work wonders. Travelers are already perceived as being “rich.” Compared to the wages in some of the lesser developed countries, this is probably true. Bedecked with multiple camera bodies, photo vests and other “luxuries” it’s easy to see how this perception exists. What can we do about this? Keeping a low profile (one camera body and a short zoom) can certainly help. 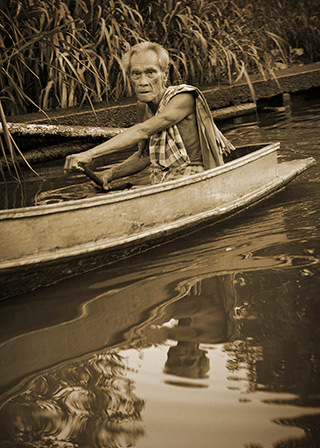 © Marla Meier. All rights reserved. A few sucres, yen, baht, or pesos may pay for the privilege of making the photo, but what happens when the next visitor comes along? Choose fewer subjects and spend a little more time developing a relationship with them, perhaps sharing some stories of your home town and photos of your family. 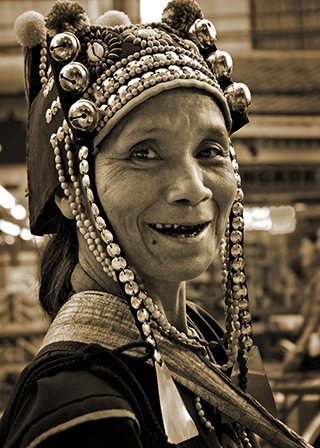 In some locations, such as native villages on a foreign tour, a fee may be paid by the tour company in advance for the privilege of photographing the locals. This may be one answer because it relieves you of the thought, “Should I be paying for this photo?” But is it possible to get honest, candid photos in this situation or are the subjects acting? It’s up to you. Avoid the crowd and look on the edge of the main activity. I often used my Polaroid camera as an icebreaker. When I find a willing subject, I give the Polaroid photo first and then proceed to make my more “serious” photos. Today, Polaroid makes a new digital version – Polaroid Instant Digital Camera with ZINK Zero Ink Printing Technology. A number of years ago, while traveling in Colombia, I ventured upon some adorable children who were walking home from school. I directed them to pose on the steps of the local iglesia. More and more children kept appearing and I continued to give the “gift” photos until I heard that news had spread of an “American photographer” in the plaza giving photos to all of the children in the town. I certainly was not prepared for this! Every time I think back on that experience, it makes me chuckle. The children were so appreciative and we all had fun, but where do we draw the line on giving free photos? There are many places in the world where people photos are unacceptable because the local belief is that the act of making the photo “steals the soul” or the law does not allow you to photograph in certain situations. Do some advance research before traveling to be prepared and respect their wishes to not be photographed. Keep in mind, there are always exceptions and the way you handle yourself and your equipment may change someone’s mind. Developing trust, having integrity and being sensitive to each individual situation generally works for me. Be polite, courteous and considerate of those you want to photograph. The quality of the photos I take home and the friendships I make are what’s important. Though not always possible, I often get an address and send back some pictures when I return home. Because there are so many more travelers visiting the far corners of the world than in years past, photographing people may be more challenging now than ever. Ask for permission and if refused, don’t be offended. You may choose to “tip” on certain occasions. Many people who you aim your lens at will feel honored at being chosen. I find that patience and a smile still go a long way. And knowing where to find an extra tractor can’t hurt either!